BeagleBone Black running a lightweight desktop (LXDE) is almost necessary when developing and compiling application natively on the BeagleBone Black, especial vision related applications requiring visualization. In this blog post I will describe the steps to install Ubuntu 14.04 on BeagleBone Black with LXDE (lubuntu-desktop) as the desktop. First, follow this link for instructions on how to format the SDcard and load the boot loader and rootfs onto the SDcard. Identifier      "Builtin Default fbdev Device 0"
Identifier      "Builtin Default fbdev Screen 0"
Device          "Builtin Default fbdev Device 0"
Screen          "Builtin Default fbdev Screen 0"
Now reboot the BeagleBone Black, and you should see something like the picture shown at the top of this post. 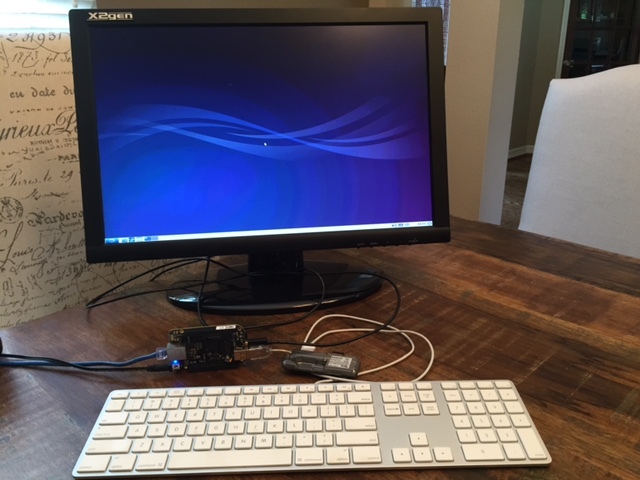 Connect a USB keyboard and a USB mouse to the BeagleBone Black, login into LXDE. Immediately turn off Light Locker under the Preference→Light Locker Settings. This is needed to prevent a screen lock bug from keeping you locked out of the desktop. It is highly advised that one create a swap file to enable memory swap. This is often necessary for memory-intensive applications to run properly, including building a large software package and video/imaging applications. Now enter the command top to see if the swap memory is no longer showing zeroes.